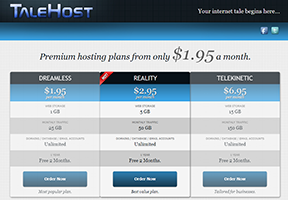 TaleHost is a relatively new web host that has only been in operation since May of 2013. While this may turn some of you off, it really is something that you should be able to work with when you see all the positives that choosing a new host has to offer. Located in Chicago, IL, they offer 3 hosting packages based on your storage and traffic needs. Their packages include accounts that will be suitable for customers ranging from small, low traffic websites up to small to medium sized business pages that require a more robust list of features. I always find it difficult to review newer web hosting companies because it is difficult for them to stack up against the competition of older, more established web hosts. In most cases they just don’t have the capital or staff to match what a well established company offers. Having said that, TaleHost offers incredible server speed and reliability at pretty affordable prices. 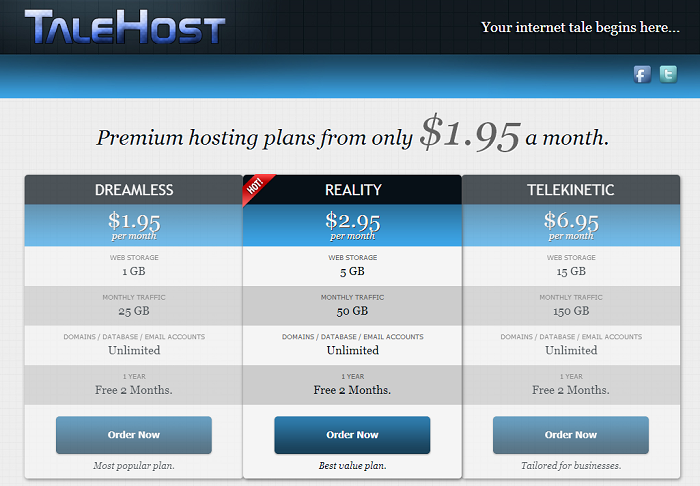 TaleHost’s prices make them competitive with much of their larger competition. Their most basic package, which is best for smaller static pages, starts off at just $1.95/month. If you commit to 1 year the price drops to $1.63/month which should be affordable to anybody looking for an inexpensive way to start hosting. While TaleHost doesn’t really include a page on their website that shows a list of features the way other hosts do, they do offer a lot of features that you would want in order to make your web hosting experience easier. One great thing about their packages is that they don’t market the hosting space and bandwidth as “unlimited” like so many other hosts do. Each package has set limits so you know exactly where you stand instead of getting unexpectedly shut down for using “too much” of the unlimited resources. This is one of the highlights of choosing a smaller, start up web hosting company. The server is guaranteed not to be overfilled with customers, leaving you with incredible up time and server responsiveness. As you can see by my tracking software below, my account with TaleHost has 100% uptime with an average response time of 44 milliseconds. Just to put that into some perspective, my website is on a VPS with VPSDepot.com and my response time average 460 milliseconds, which is by no means slow. Note: The response time will be faster for me than some other people because I live in Chicago which is where the servers are located. Don’t get mad at me if your response time is 80 milliseconds as opposed to 40, it’s still damn good. While TaleHost has only been around for a few months it is run by individuals who have worked at several other hosting companies over the years. The support they provide is good, however since it is still a small company with limited staff support is not available 24/7 yet. As the company grows they will be able to hire on more people and eventually provide 24/7 support. I’m a sucker for small web hosting start ups. I’ve been a part of some myself. It is not an easy industry to break into, especially with the way affiliate programs are used to dominate review sites. If you’re looking for an inexpensive place to host a website that will be up all the time, give TaleHost a look.